DS Brain Age (USA) "playaround" in 06:33.66 by Ryuto. Brain Age (also known as Dr. Kawashima's Brain Training) is a puzzle game designed on the premise of exercising your brain. In this run, for example, the idea is to solve a series of simple mathematical puzzles. And yet, the answers given... are not exactly what you'd expect. The same author of the previous run brings you a set of 51 new ... answers, with extra time taken to provide you, the viewer, with the greatest possible attention to detail. 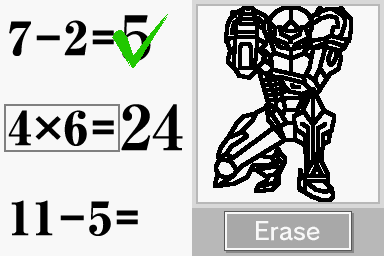 Additionally, the increased detail provides a higher level of difficulty, to prevent the number recognition from checking the answer before the image is complete. If you liked how this movie abuses a drawing recognition system, also see the trouble that TAS tools bring to a text recognition system.